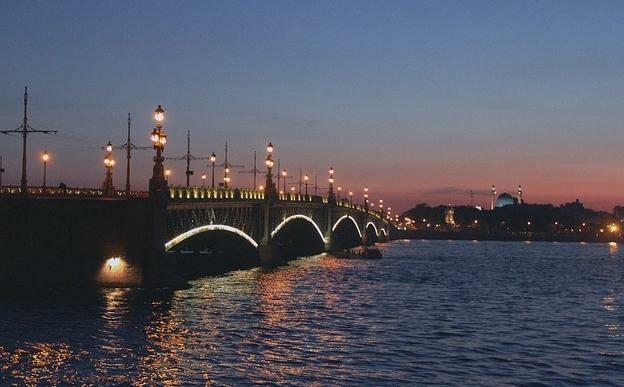 The beginning of White Nights in St. Petersburg is considered to be approximately May 25th. During this time bright evening twilight merges with the morning. In these days the sun descends below the horizon, no more than 9 degrees and a glow emerges in the sky to keep the darkness away. By June 21s, the length of day is 18 hours and 53 minutes, the longest day of the year and the twilight continues through the night. After three days of the summer solstice the day length begins to decline, and the end of the midnight sun can be considered on July 16th. The southern edge of the White Nights takes place at a latitude of 49 º. The farther north you go the more the nights become brighter. 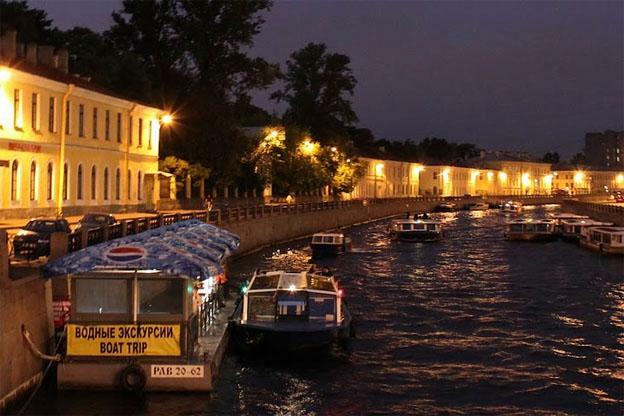 It was during White Nights that St. Petersburg is engulfed with romance. Citizens and visitors forget about every day cares and become dreamers in the golden twilight. Against the background of the famous White Nights ensembles, palaces, temples, bridges, monuments and fencing of the city not only affect the external appearance, but also create an unforgettable sense of inner fabulousness and unreality, and the city fulfils all desires after the long, dark winter. St. Petersburg is often associated with white nights because of Russian literature. However White Nights is celebrated in many northern cities such as Arkhangelsk and Murmansk. 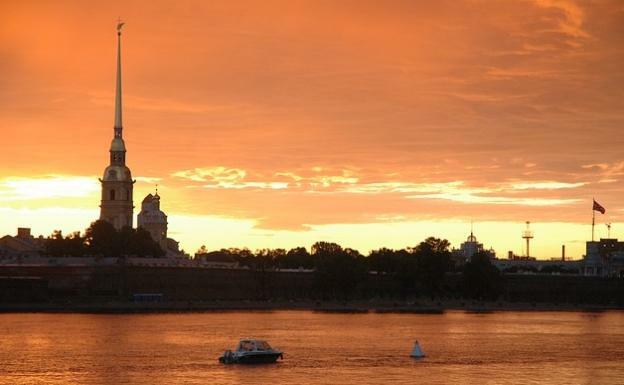 In addition, White Nights can be enjoyed in Moscow, but in the capital the night is not as bright as in St. Petersburg. The farther you go north, the longer the period of White Nights. In St. Petersburg during there are 23 twilight nights, in Petrozavodsk – 52, and in Arkhangelsk – 77 nights. Near Tiksi Bay, in Yakutia, the sun does not sink below the horizon from May 12 to August 1. In a hurry, giving the night half an hour. The bright lights of Nevsky Prospekt are replaced by the mysterious twilight of ancient streets and canals. Countless bridges with lights that connect to the shore, illuminated facades of the palaces, are reflected in the black water and take us to the past glory of St Petersburg. The golden and romantic atmosphere of the night city gave inspiration to poets and writers for generations. Granite embankments, homes and monuments, snatched from the dark by electricity or light enveloped in twilight, look fabulous as scenery to the mysteries of the night in St Petersburg. It is common for lovers to walk hand in hand along the rivers and canals. Sailing by boat along the Northern Venice tourists see the most extraordinary event of the White Nights, as if specially designed for lovers and romantics – the bridges over the Neva River. It is both a majestic and breathtaking spectacle, especially if you observe it from the boat. There are many different boat tours which provide opportunity to make amazing photos. Some of the boats even offer live music, drink, food, and dancing as part of the program. A boat trip provides an opportunity to see the city from an unusual angle, and to watch what can’t be seen from shore or from a tour bus window. Many tourists and citizens also walk to the bridges at night to see them open and to view the city with no traffic jams. The city is alive both day and night and in fact the night seems to never come and the day never ends. A 24 hour celebration of the golden summer is a grand and enchanting site to see. During White Nights there are many festivals and celebrations which take place in St. Petersburg. The White Nights Festival, a combination of classical music, opera, and ballet performances is held from May through the end of July. The “Scarlet Sails,” festival, a high-school graduation party dating back to the end of World War II, takes place at the end of June, and includes students from all over Russia and the former Soviet Union. The celebration includes fireworks over the Neva and a beautiful red sail schooner which moves slowly down the Neva River. The ship is modeled after one used by the imperial family in the late 19th century. Brian Schweitzer the author of the “White nights in St. Petersburg” is an internet marketing consultant, a world traveler, and recommends Dancing Bear Tours – Dancing Bear Tours is a family owned and operated private tour company in St. Petersburg Russia which offers customized and flexible tours for individuals, small groups, VIP’s, families, and people with special needs.